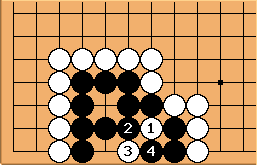 Black should make life as long as it's possible, even if it means losing the marked stones. 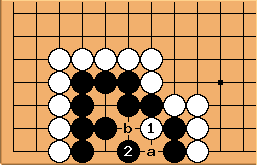 Should White play at , the snapback will destroy Black's chance to make two eyes and the whole group dies. 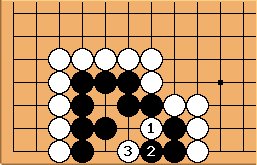 If Black plays atari at , White captures three stones with , which also destroys any chance of a second eye. shouldnt black be able to live if he plays at ? if white plays at "a" black plays at "b" and if white plays at "b" black plays at "a"
Tapir: Yes, this is the solution. It's essentially the same as the first diagram. Anonymous: Question, given that you cannot take a stone that has just captured one of yours is not move 5 possible since 4 has just taken? Answer: The rule is that if a single stone captures a single stone, that stone may not be taken back immediately. 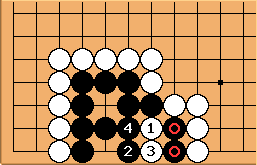 In the diagram 3 stones take a single stone at move 4, so those three stones may be captured on the next turn.